Jazz composer and arranger. Collaborator with Duke Ellington. 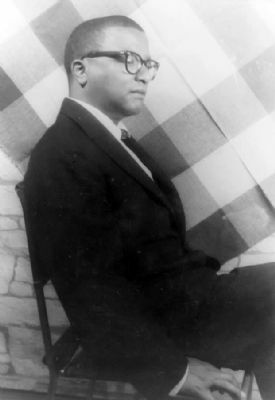 Billy Strayhorn's "Take the A Train" became the Ellington orchestra's theme song. A graduate of Westinghouse High School, Strayhorn had his musical talents nurtured here. Erected 1995 by Pennsylvania Historical and Museum Commission. Location. 40° 27.643′ N, 79° 54.021′ W. Marker is in Pittsburgh, Pennsylvania, in Allegheny County. Marker is on North Murtland Street 0 miles north of Monticello Street, on the right when traveling south. Touch for map. 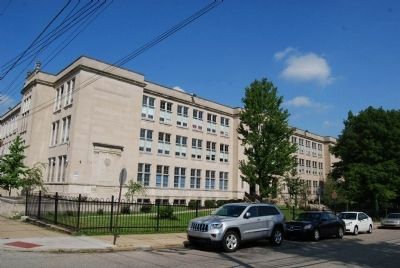 Located behind fence at Westinghouse High School in Pittsburgh's Homewood section. Marker is in this post office area: Pittsburgh PA 15208, United States of America. Touch for directions. away); St. Peter's Evangelical and Reformed Church (approx. 1.1 miles away); Frank Conrad (approx. 1.1 miles away); Calvary Episcopal Church (approx. 1.2 miles away). Touch for a list and map of all markers in Pittsburgh. More. 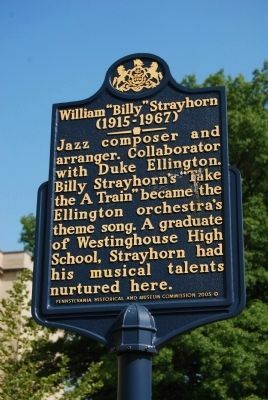 Search the internet for William "Billy" Strayhorn. Credits. This page was last revised on June 16, 2016. This page originally submitted on September 11, 2011, by Mike Wintermantel of Pittsburgh, Pennsylvania. This page has been viewed 456 times since then and 8 times this year. Photos: 1, 2, 3. submitted on September 11, 2011, by Mike Wintermantel of Pittsburgh, Pennsylvania.